The napkins I made last year are great except making them was kinda a pain in the neck with all the ironing and looking for little folds, etc. Don’t get me wrong, that Katy is brilliant! I also used the same method to make my scrap color baby quilt backing. When I decided to give these as gifts for christmas this year, I discovered an even faster way to do the corners which makes the whole project a snap! UPDATE! I have a youtube video I made to show clearly how to make these napkins. If you prefer a video format for learning, this will work great for you! Let’s begin by choosing our fabric and how much to use. 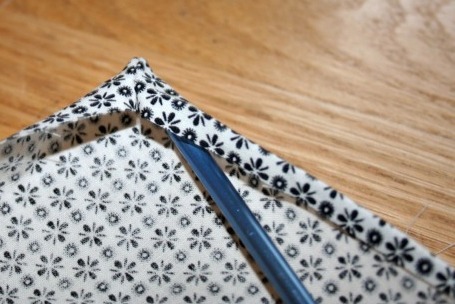 To switch your family over to fabric napkins you need to make at least 8 napkins and 12 is even better. We have 5 in our family and 12 works great so that I wash every few days. 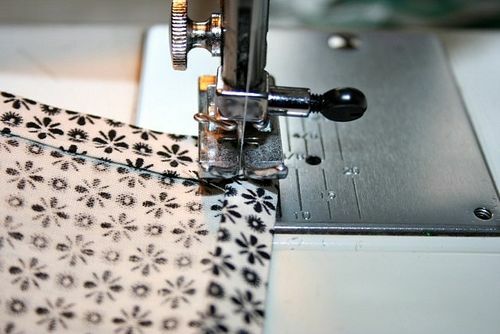 To make 12 you need 2.7 yards of 100% cotton fabric. 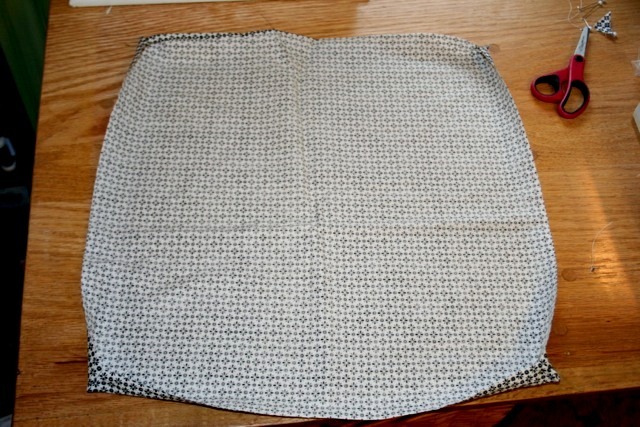 I like to make my napkins 16″ x 16″. This is a good size for grown ups and kids. If you have only grown ups and teenagers using the napkins, then you could go up to 18″ x 18″. That is too big for the little hands in our house right now. Using a rotary cutter, self healing mat, and a large clear ruler, cut squares that are 16″ x 16″. Try to make your squares as “square” as possible! 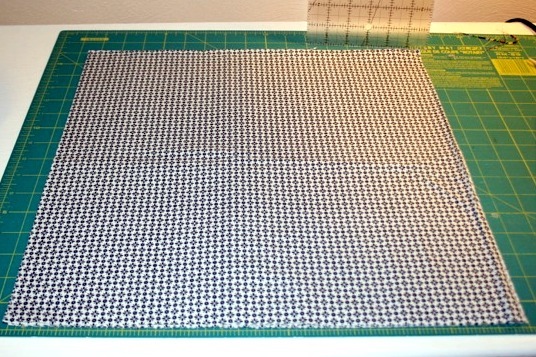 Next you will mark off a 45 degree angle on each corner of the fabric piece. Do this on the wrong side of the fabric. Most self healing mats will have markings to guide you. I just use a pencil to make this mark 1 inch down from the corner tip. I don’t like how chalk rubs off and you need to be able to see this line in several steps. 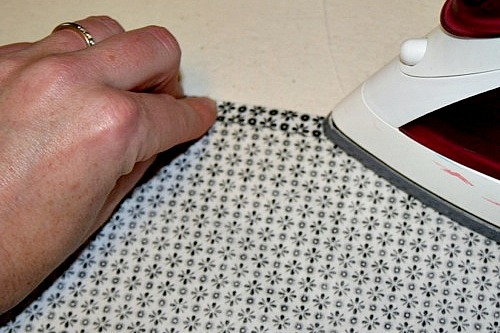 Now over to your sewing machine. 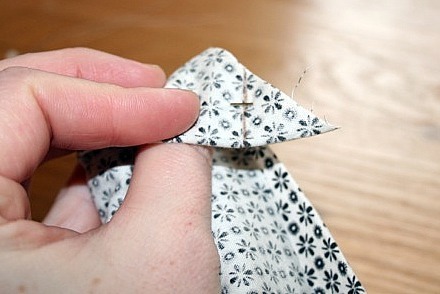 Sew a short line from the fabric fold edge to the pin you placed in the middle of the line you made in the last step. 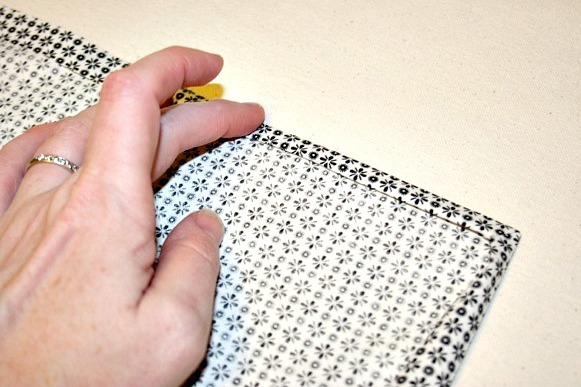 Make sure you do a backstitch at the beginning and end of this small stitched line. It will only be about 1/2″. 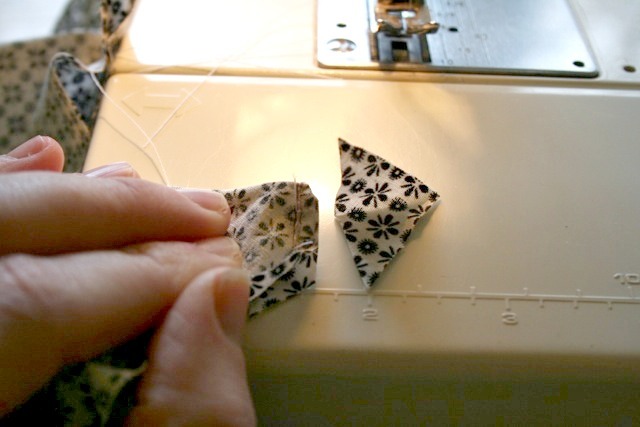 Next, with your scissors, clip off each corner about 3/16″ above your corner guide line. 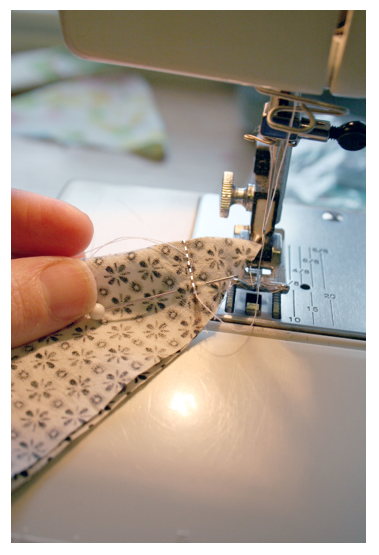 In this step, also clip off those threads from the stitches of the last step. Clip all 4 corners. Now that you have ironed all 4 sides, go back and fold that edge under again to make a hem that is about 3/8″ wide. Take advantage of how the edge naturally folds under from when you made the corner. Iron the hem nice an flat. The corners should lay flat too. It there is a slight imperfection, don’t fuss too much since it works out nicely in the end. Now, if you feel like you can’t live without pins here, go ahead and use some, but i think it is easier to not use pins and let the fabric make natural adjustments as you sew around your edges. 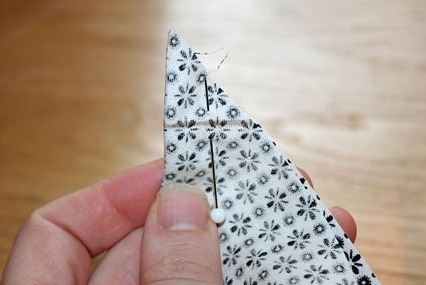 Begin a couple inches above one of your corners (starting at a corner usually ends up badly! 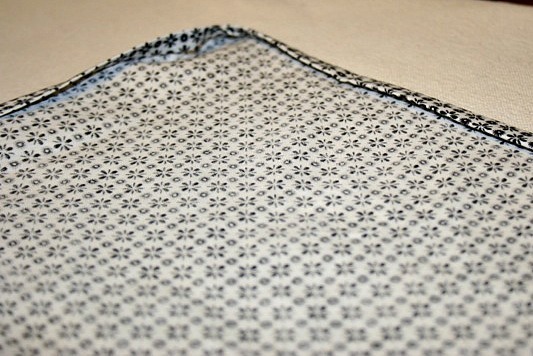 ), and sew around all four sides of your napkin until you overlap where you began. Clip your threads and move on the next napkin! I printed out the page on cardstock and then cut out the shapes. I then used a small hole punch and strung some bakers twine (yes! I am now officially a user of bakers twine. I don’t really get what the big deal is but since i bought so much, you’ll be seeing lots of it here!) through to make this cute presentation. This is such a nice idea! 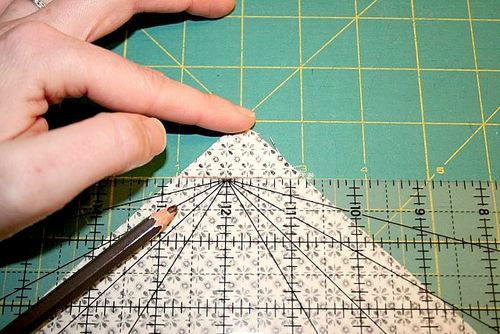 I know this is an absolutely dorky request, but can you please do a tutorial on how to use all those funky quilting rulers like the one in this tutorial??? Those things make me feel like I’m back in college algebra again. Heeelllp! Ooh fun, thanks for the great idea! Fantastic tutorial – thanks for sharing. 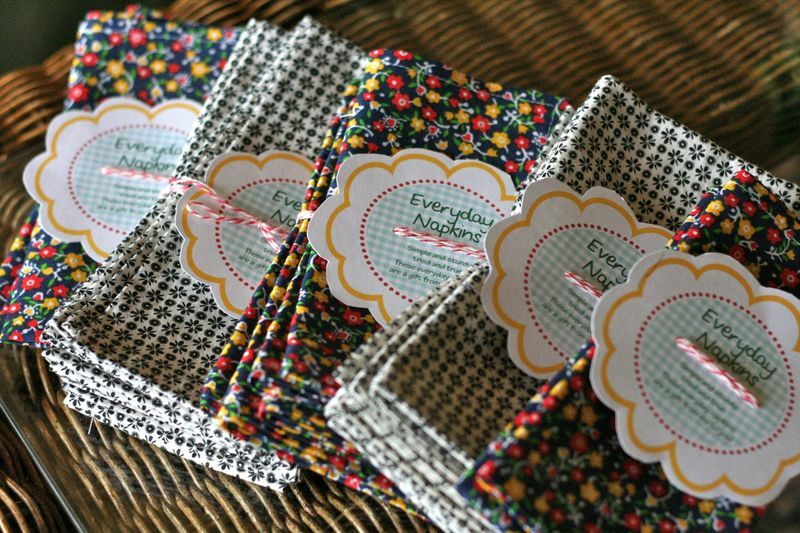 I see lots of these napkins in my future! those are adorable and I love the way you did the corners!!! The little tag is so cute too! I know what I’m making for christmas next year (and every hostess gift in between!)!! Love this! Now, do you have any thoughts on material. Do you just use a quilter cotton, polyester blend? Does it matter? I’ve had this on my to do list for 3 months and now I’m going to try it! Thanks for the awesome tutorial! I can see myself making tons of these as gifts (and for me!). I’m really excited to try them. I might give these a try. I just wrote down that we need more cloth napkins around here. I’d like to do some in fun fabric. I’ll let you know how it goes if I do it. Thanks for this wonderful tutorial. I’m saving this idea for this year’s CHristmas gifts. Hope you won’t mind me pinning it to Pinterest for reference. Many thanks again! I’ve been giving 2 cloth napkins as wedding gifts for the last few years. And I have a stash of about a dozen that I use. Thanks for posting. I made a set of 8 after dinner one night and plan on making a few more for give-a-ways! It’s a great way to use funky fabrics! I’m trying to make these napkins, but I think I’m doing something wrong. I have folded over all the edges and corners and I’m ready to sew. But if I just sew around the square, there is some left unsewn at each corner. Am I supposed to miter the corners? I’d appreciate your help. What an awesome tutorial! I just wanted to thank you for your time, effort & inspiration. 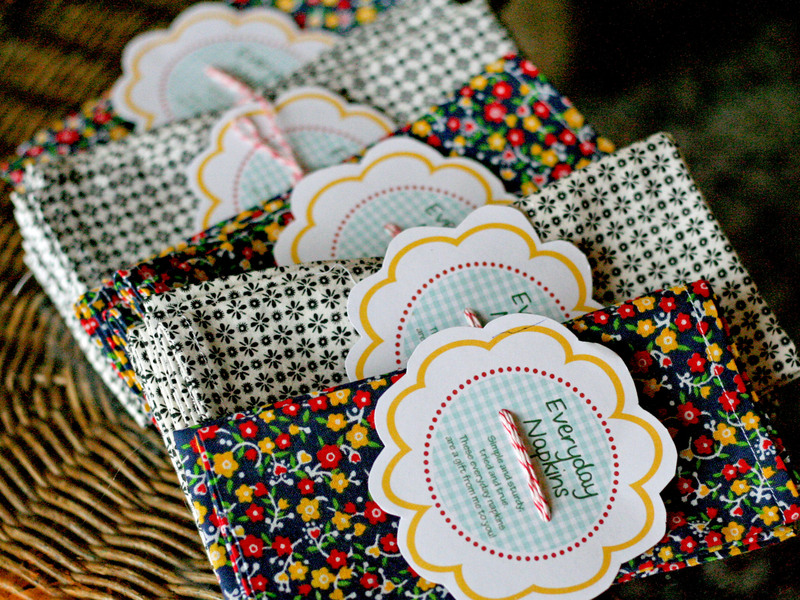 I have some lovely new napkins… WhooHoo!! Love these! Can’t wait to make a stack for my house. I can’t open the file for the tags, is there another way to access it? I would love to make some as gifts. THANKS! That technique for the corners is seriously brilliant! I just used it and couldn’t believe how easy it was and how well it worked. Thank you so much! Brilliant…I love this trick and I’m going to try this. Cloth napkins have been on my “to-do” list for a while!! Thanks for sharing! 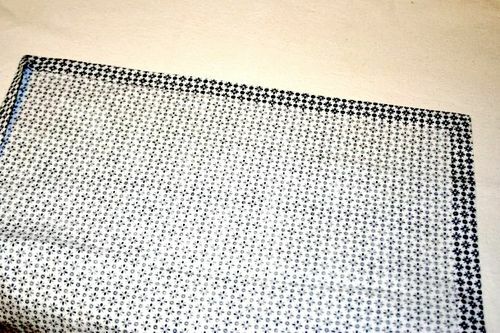 I just bought fabric for a new set of napkins and I was slightly dreading all of the pinning and such. I’m a very novice sewer. I am so excited to make my next set now!! Thank you for a great method and tutorial! 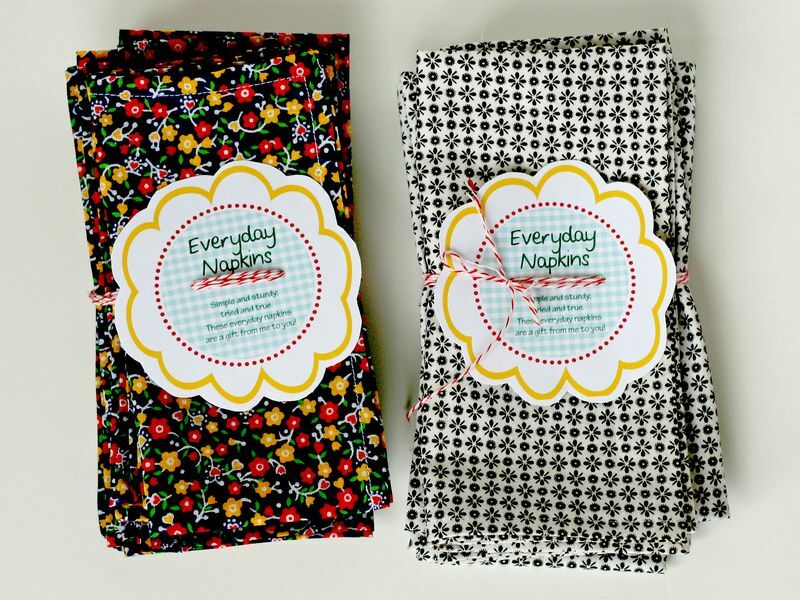 I love using cloth napkins and use to make them especially for the holidays, but this is the best method I’ve seen. Thank you so much for the miter corner tutorial. It is so easy and neat! Wish I knew about it years ago when I needed 12 napkins for the holidays. If you cut them into exact 16″x”16″ squares wont this bring them down some in size? I actually need 18′ x 18″ napkins and not sure if I should cut at 18 and 1/2″ or 18 and 1/4″ inch to get the actual 18″ x 18″ I need. Any help? hi Jennifer! The solution for you would be to cut them 18.5” x 18.5”. then you would have an 18” napkin in the end. 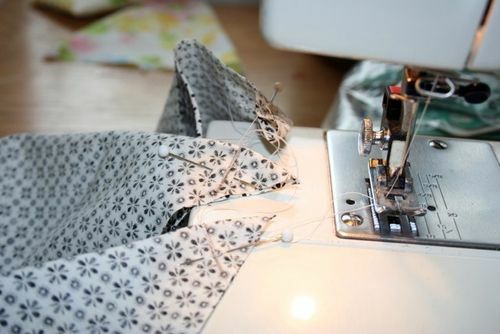 Do you wash the fabric before sewing into the napkin? I really love this idea!!! Thank you for sharing!! What a handy way of hemming these! Thank you! Right out of college I lived in Southeast Asia for a couple of years. Paper napkins weren’t so readily available, so we used cloth napkins every meal in the family I stayed with. To cut down on laundering we each had a different napkin ring. That way we always knew which napkin was our own. When the napkin was too soiled we could get a fresh one, but this way we didn’t need to put barely used napkins in the laundry. Do you prewash the fabric? What type of fabric do you use? I have a dozen to make and this will definitely make the job fast and easy. Thank you so much for this wonderful tutorial. I used it to make 200 20 inch muslin napkins for my son’s October 7, 2017 wedding, which was held in an old warehouse. The cost of purchasing/renting “rustic” napkins was unbelievable. It was more cost effective to purchase muslin online, and I used the Quilt in a Day 22″ square up ruler to make the perfectly sized 20″ napkins. It was a labor of love for this total DIY wedding. My husband made pallet wood walls, donut boards, hexagon wall decor, my father made a custom metal cross, rusty and galvanized metal table numbers, and a “whale” shaped brand that we heated and branded whales on some of the wood items….the couple collect whales. We all worked closely with the brides family to bring the rustic yet romantic wedding together. Imagine my dismay when the wedding coordinator put all the napkins in a black trash bag and they were accidentally thrown in the trash!!!! Thankfully my husband made the hour drive the next day and retrieved them!!!! Love this tutorial! Thanks again!! Yay, been wanting to make “tea towels” from some 1950s tablecloths, but the corners made me hesitate. This is great, thank you.